An effective CPQ (configure-price-quote) implementation will almost certainly enhance supply chain visibility. Your organization creates more than products and revenue; it also creates data—lots of data. This data is created, used and stored by multiple functional units within your enterprise. It is probable that much of it resides in a variety of applications and systems that serve those assorted, specialized functional units. These data sets include things like customer profiles, sales histories, product information systems, bills of material (BOMs), production schedules, pricing files and sales-territory and quota-assignment files. The applications and systems responsible for all of this data will include more familiar acronyms like CRM (customer resource management), OMS (order management systems), PLM (product lifecycle management), MRP (manufacturing resource planning) and ERP (enterprise resource planning). All of this data and information is highly useful to the organization not only during specific transactional business processes but also over the much longer duration of time in the form of assorted trends and predictive elements. Further, this information has great utility beyond the confines of the hosting enterprise into what we like to call the supply chain. This holds true not only for upstream partners that supply your enterprise with raw material, parts and assemblies used to turn out product but also for downstream partners that either sell or use your products in the manufacture of their own. This is what business-to-business commerce is all about. Although supply chains are frequently visualized as funnels feeding downward into a final point that represents the manufacturer, this is not an entirely accurate vision. Any manufacturing or selling organization must understand they are part of the supply chain, taking in product and turning out product based on the requirements and needs of end-users downstream. It is important to understand that distinction because when we discuss supply chain visibility, we must realize the benefits, requirements and needs associated with supply chain visibility extend upstream from the enterprise and downstream into the customer supply chain. This supply chain collaboration facilitates a seamless product-delivery process across multiple organizations from the original supply and material source to end-user product delivery. What Does Supply Chain Visibility Mean? Who is in possession of the order at any given time? What sources are available for this product or supply? What is the status of payment? How can a product be returned? What is the status of the product return? What product options have been ordered? What is the order frequency for this customer? Is it a recurring order or a single standalone transaction? What is the status of their payment? What delivery requirements do they have? Visibility means that not only you can look upstream, but so can your customer and their customer. Visibility makes the entire acquisition and production process visible in real time across multiple organizations―from raw material in the ground to finished product delivered to the end-user. The challenge of obtaining supply chain visibility is to pull all of that data out from behind whatever systemic or proprietary wall that surrounds it and make it accessible to those who need it. CPQ employs data from all of the sources cited above. The sales systems, product systems, production systems, inventory management and financial data all flow into CPQ to enable it to perform its work with configuration, pricing and quotation or proposal building. CPQ provides a federated view of that data, and that is the critical mechanical challenge to achieving supply chain visibility. CPQ looks upstream for part and supply availability during the sales interviewing process. Upstream partners can see this activity in the form of product inquiries and predictively interpret that data to drive their own acquisition and production schedules. Downstream, the buying partner can look upstream, review the configuration under consideration and look at pricing history for predictive interpretation of pricing stability over time. Once ordered, the progress of the production and shipment of the product can be tracked, and a delivery date can be established. 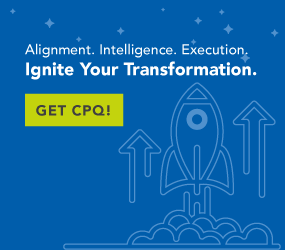 CPQ is a great enabler of visibility between organizations. By federating the useful data within the hosting organizations, it provides a single point of contact with supplying organizations as well as distributors and customers. In those instances where CPQ is deployed in the upstream or downstream partner enterprise, that interconnectivity challenge is made even easier. CPQ can communicate effectively with other CPQs to create a seamless vision from one end of the chain to the other. CPQ promises a lot, and it may seem like sort of a high-tech hype cycle option. But CPQ is nothing really mysterious, and it’s equally useful either on-premise or cloud-based. CPQ may use SQL database technology―or in some cases, more sophisticated business rules engines―to reduce costs associated with database management and maintenance. For suppliers, customers, manufacturers, distributors and resellers, CPQ provides the visibility needed to meet the changes of operating within a complex supply chain.